We love to hear stories from clients and families about local BrightStar Care caregivers making a real difference in their lives. A caregiver to some is a life changer to others. To show his appreciation, David wrote a letter to Thom Gilday, BrightStar Care’s President and Chief Operating Officer, and David gave us permission to share the letter with all of you. Hello, I wanted to compliment you on a few agencies that I have been with since 2010. My name is David Cubarney, I receive attendant care from BrightStar in North Hills, the owner is Dave. I also receive skilled nursing from BrightStar in Mt. Lebanon. I just want to tell you how fantastic these two companies are. Before coming to BrightStar, I was with another company and I was overmedicated with expired medications, and found non-responsive, leaving permanent damage to my lungs. The hospital did not think I would recover. This incident occurred more than once. They had those aids not getting me out of bed and I was ill with pneumonia due to this. I am a severe quadriplegic, with Cerebral Palsy, so I cannot move any of my extremities. The UCP [United Cerebral Palsy] put us in contact with BrightStar. I have then since utilized their services. The owners personally met with me before my intake. This put me at ease and showed great consideration for clients like myself. I receive services from different facilities due to my area and waiver. Uday and Dave (the owners) worked hard to find the most coverage in my home. Both companies do an outstanding job with every situation pertaining to my care or the care management in my home. They both make me feel highly respected and appreciated. I now am on the board of directors with Mt. Lebanon, they take consideration of my opinions greatly. I am having one of my nurses write this now. Believe me, this letter is my own words. 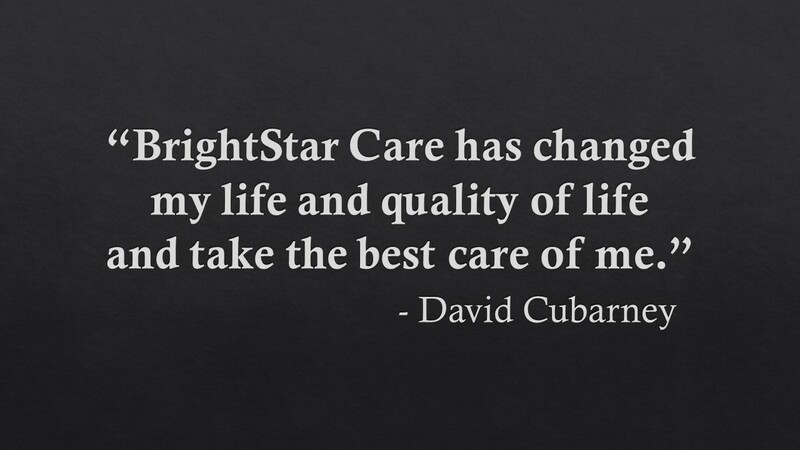 BrightStar has changed my life and quality of life and take the best care of me. My care hours are around the clock. I wear a BiPAP at night due to my sleep apnea. BrightStar is by far the best agency in the state of Pennsylvania. If anyone I know would need service, I would and have recommended others. In closing, I would like to say the aids and nurses care so greatly and if we had more agencies like this, the world would be a better place. Lastly, on August 26, 2016, I had a bad accident causing me to be in the hospital. In order to come home I would require even more care from BrightStar. BrightStar took on the challenge and did all they could, and I was impressed as usual! They are the reason I did not have to go to the nursing home and my care providers did an amazing job. I would love for you to know how much your franchise is appreciated. Thank you for your time. P.S. The outpour of concern for me from BrightStar is Phenomenal. Thank you for all you do!